I take pride for the Tatmadaw (Navy) as it can build war vessels. These ships meeting standards can sail the sea. It is a great honour for our Tatmadaw as among the armed forces in the Southeast Asia, the Tatmadaw alone can build frigates at its own shipyard. Keeping this tradition, the Tatmadaw needs to build advanced naval ships, said Commander-in-Chief of Defence Services Senior General Min Aung Hlaing, wearing Myanmar Navy Uniform as a mark of honouring Myanmar Navy Day, at a ceremony to mark the 70th Anniversary of Tatmadaw (Navy), at No 3 Naval Jetty in Yangon this afternoon. The ceremony was also attended by the Senior General’s wife Daw Kyu Kyu Hla, Commander-in-Chief (Navy) Admiral Tin Aung San and wife, Commander-in-Chief (Air) General Khin Aung Myint and wife, retired Commander-in-Chiefs (Navy), retired Commander-in-Chiefs (Air), retired senior military officers, senior military officers from the Commander-in-Chief’s Office (Army), the Yangon Command commander, Naval Region Command commanders, officers and other ranks and their families. First, Chief of Staff (Navy) Rear-Admiral Moe Aung explained the facts about naval ships. Afterwards, the commander of Naval Dockyard Command Headquarters handed over documents relating to naval ships to the Commander of Naval Fleet. Then, the Commanders-in-Chief (Navy) presented a scale model of naval ship to the Senior General for marking the commissioning ceremony of new vessels. 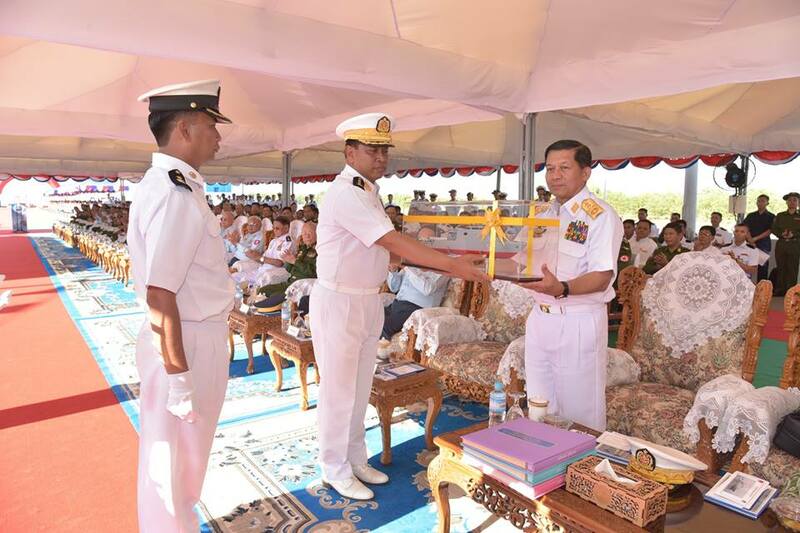 After that, the Chief of Staff (Navy) declared the new vessels as the commissioned vessels, hoisting the National Flag, Tatmadaw (Navy) Flag and Commissioning Flags and striking bell for eight times in line with the step-by-step commissioning process. 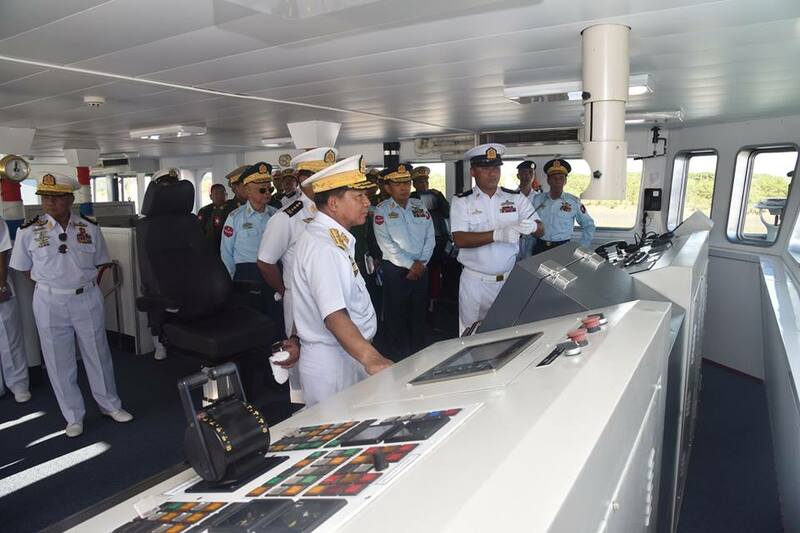 Afterwards, the Senior General and party inspected commissioned vessels—56-metre landing craft tanks carrying armoured vehicles and 29-metre landing craft inspected the offshore patrol vessel named Inlay. Officiating units on the patrol vessel welcomed the Senior General and party and conducted round them. Afterwards, the Senior General signed the visitors’ book at the hall of the offshore patrol vessel Inlay. Then, the Senior General took the salute of the Guard of Honour from the dais on the naval vessel-Inlay while Yantaingaung and Yangyiaung vessels fired 19 shots. Then, the Senior General inspected the Guard of Honour. Then, the Senior General took the salute of the frigates namely Kyan Sit Thar, Sin Phyu Shin corvette missile carrier Tabin Shwe Htee and Fast Attack Crafts led by frigate Aung Zeya, in the Single Line Formation. At the time, a eurocopter type helicopter saluted the Senior General by landing on frigate Aung Zeya. After that, the Commander-in-Chief (Navy) presented the first artillery shell from gun-salute to the Senior General. Then, the Senior General presented gifts for officers and other ranks from the frigates and commissioned vessels via officials and presented certificates of honour and cash for officers and other ranks who engaged in the building of commissioned vessels via Commander of Naval Dockyard Command Headquarters Commodore Thant Zin Lay. In his honouring speech, the Senior General said he honoured engineer officers and other ranks which built naval ships, from Tatmadaw (Navy). The Tatmadaw (Navy) had a duty to safeguard Myanmar territorial waters. It was not an easy task to safeguard the far and wide territorial waters. The Tatmadaw (Navy) which originated from Mayu vessel had to go through the rocky roads. The Tatmadaw (Navy) had no sufficient number of naval vessels to fully safeguard its own water territory. Since 1990, the Tatmadaw (Navy) started buying naval vessels. In addition, the naval vessels were built in outside shipyards. However, there were no enough war vessels. Therefore, the Tatmadaw-owned shipyards were built in order to build war vessels which have capability and can protect the territorial waters. Due to it, the Tatmadaw built its own shipyards to build modern ships that can safeguard the territorial waters. It could build advanced naval vessels thanks to the ship building experience. As frigates were built to strongly protect Myanmar sea, the Tatmadaw (Navy) has capability to keep abreast of others in Southeast Asia. At present, the Tatmadaw (Navy) builds war vessels itself with improved capabilities. It is because past leaders of the Tatmadaw laid down foundations for producing qualified human resources. The motto of the Tatmadaw (Navy) is ‘‘ To Protect Myanmar Sea,” and the policy was adopted for the Tatmadaw (Navy) to become a Blue Water Navy. As the Tatmadaw (Navy) needs to have larger and higher capable war vessels to become the Blue Water Navy, the Senior General stressed the need to try hard in technologies, techniques and tasks so as to have capability to threaten the enemy. Now, the Tatmadaw (Navy) of Myanmar, top in Southeast Asia, is recognized by the international community. Afterwards, the Senior General pointed out that it is necessary not only to build war vessels but also to train Tatmadawmen themselves to have high capability. These war vessels must be used. Only when it needs to use the war vessels, will Myanmar sea have security facilities. The Tatmadawmen from Army, Navy and Air must discharge duties for life security of the people and they needs to continuously maintain such traditions. 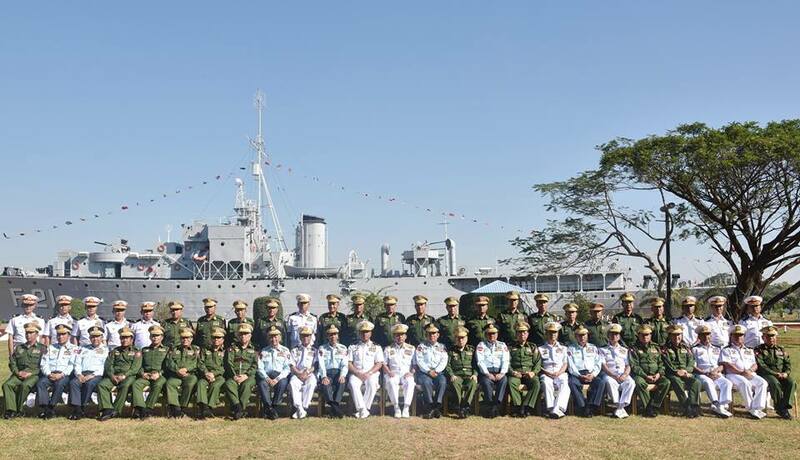 Then, the Senior General and party cordially greeted officers, other ranks and families who attended the ceremony and officers, other ranks and war veterans from the Tatmadaw (Navy) who participated in the building of war vessels. In the evening, the Senior General and party left No 3 Navy Jetty for Ayeyawady Naval Region Command Headquarters by war vessel Yadanabon. 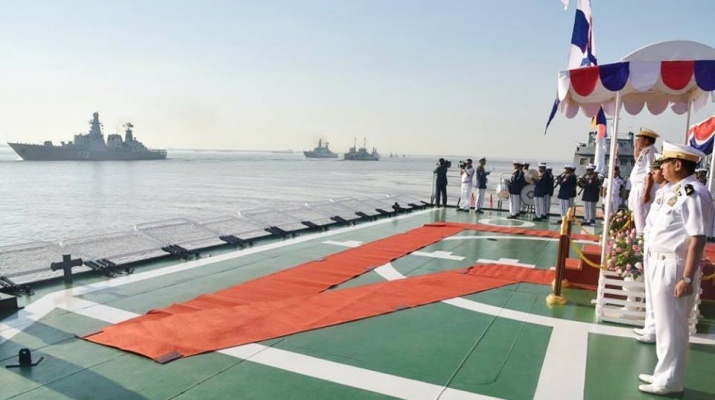 Onboard the war vessel, the Senior General and wife Daw Kyu Kyu Hla cut the commemorative cake to mark the 70th Anniversary of Tatmadaw (Navy). Commander-in-Chief (Navy) Admiral Tin Aung San presented emblems in commemoration of the 70th Anniversary of Tatmadaw (Navy) to Commander-in-Chief of Defence Services Senior General Min Aung Hlaing, Commander-in-Chief (Air) General Khin Aung Myint, retired Commander-in-Chiefs (Navy) and retired Commander-in-Chiefs (Air). 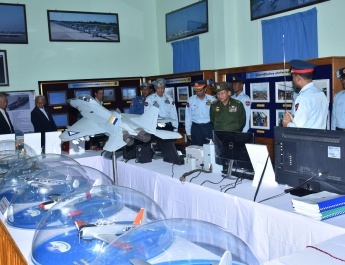 The Senior General and wife cut the ribbon to open the booth to mark the 70th Anniversary of Tatmadaw (Navy) at Ayeyawady Naval Region Command Head-quarters and visited the commemorative booths and the booths of respective naval region commands. 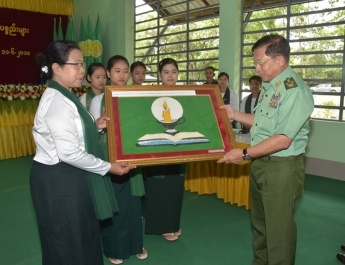 After enjoying the entertainment of the Tatmadaw (Navy) Military Band, the Senior General and wife presented cash awards to them. The booths to mark the 70th Anniversary of Tatmadaw (Navy) showcase naval documentary photos, naval equipment and small scale of naval vessels, and book shops and shops of personal goods manufactured by the Tatmadaw sell books, personal goods, domestic products and Myanmar traditional foods. In commemoration of the 70th Anniversary of Tatmadaw (Navy), one offshore patrol vessel, two 56-metre landing craft tanks and four 29-metre landing craft, totalling seven were commissioned into service today. 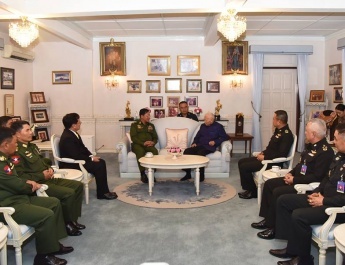 In the morning, the Senior General and party arrived at Naval Dockyard Command Headquarters where they viewed round naval equipment manufactured by the Tatmadaw (Navy). At the hall of the Naval Dockyard Command Headquarters, the commander reported on construction of new vessels, upgrading and maintaining the vessels with the use of powerpoint . After heading the report, the Senior General gave necessary instructions and fulfilled the needs. Next, the Senior General explained facts about construction of war vessel from the Tatmadaw (Navy) with the strength of engineers from the Tatmadaw (Navy), upgrading the war vessels, construction of the hospital ships, the important role of Tatmadaw (Navy) for security measures of the Myanmar sea and improvement of its capability, and building the Tatmadaw (Navy) to become a modern, capable and powerful Tatmadaw (Navy) due to foundations laid down by the past Tatmadaw leaders with farsightedness to the retired Commander-in-Chiefs (Navy), the retired Commander-in-Chiefs (Air) and senior military officers. Afterwards, the Senior General and party visited the museum of the Naval Dockyard Command Headquarters. They also viewed round construction of war vessels at the Naval Dockyard by car. In commemoration of the 70th Anniversary of Tatmadaw (Navy), Commander-in-Chief (Navy) Admiral Tin Aung San led the ceremony to offer alms to members of the Sangha and hold the parade at the local naval region command headquarters in Thanlyin Station this morning. The ceremony and parade were attended by retired Commander-in-Chiefs (Navy), and officers, other ranks and families of the Tatmadaw (Navy).